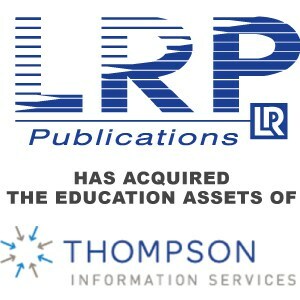 LRP Publications Acquires Education Library from Thompson Media Group - Berkery, Noyes & Co., LLC. Acquisition furthers LRP’s mission to deliver the most authoritative, timely and practical guidance to education administrators. LRP Publications, educators’ most trusted source for practical and legal education guidance since 1985, today announced that it has acquired the acclaimed Education Library from Thompson Media Group. LRP Publications’ acquisition of Thompson Media Group’s Education Library furthers LRP’s mission to continuously deliver the most authoritative, timely and practical guidance available to education administrators. By incorporating the Education Library into LRP Publications’ vast amount of content, LRP will be positioned to accelerate their ability to supply a wider variety of newsletters, books, pamphlets, eLearning courses and training tools across all print and digital platforms. Known for providing complete, reliable information on education grants, funding, Title I and Section 504, the Thompson Media Group Education Library collection features dozens of titles offering expert guidance on various challenges administrators face in the education arena. With a strong emphasis on federal education laws, the Library has built a reputation throughout school districts and among professionals for delivering expert guidance on key legal and regulatory compliance changes. Respected titles that are now part of LRP Publications’ brand include: Section 504 Compliance Handbook; The Administrator’s Guide to Federal Programs For English Learners; The Do’s and Don’ts of Education Compliance: Audits, Monitoring and Enforcement; The New Title I: The Changing Landscape of Accountability; Title I Monitor; and Federal Education Grants Management: What Administrators Need to Know. Investment bank Berkery Noyes & Co. LLC represented Thompson Media Group in the transaction. LRP Publications, the nation’s foremost education experts, delivers guidance to help educators, attorneys and other stakeholders carry out their responsibilities under education laws. Known as educators’ most trusted source for practical and legal education guidance, LRP Publications produces newsletters, books, pamphlets, DVDs, audio conferences, eLearning courses and training tools to help educators implement sound programs and avoid compliance errors related to Title I, autism, discipline and more. LRP Publications also produces professional education conferences including: National Institute on Legal Issues of Educating Individuals with Disabilities®, Special Education School Attorneys Conference, Special Education Director’s Summit, and Special Education Law Retreat With Melinda Jacobs. For a complete list of LRP products, eCourses and conferences, please visit http://www.lrp.com.